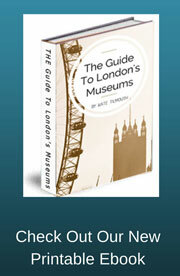 The Asian antiquities which can be found at the British Museum come from China, Japan, Korea and India. The collections are spread over two floors in rooms 33,67 and 92 to 95. On this page you will discover item from China including some beautiful Chinese jade. I focused on this gallery in the British Museum Asia collection as it is the largest part of the collection and contains some of my personal favourite items of interest. Standing in this gallery is a rather fearsome ceramic statue of an assistant to a judge of hell. 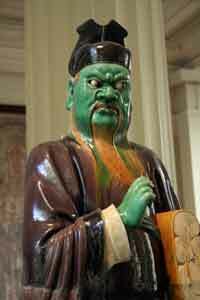 He has a bright green face and hands and is dressed in full length robes. He is holding a large book of scrolls under his arm. He is a very impressive character and looks in mint condition which is amazing considering he dates back to the 16th century Ming Dynasty. This is a short video showing some of the items from the Asian Gallery. Another impressive piece or should I say pieces are the Tang dynasty Tomb figures which each stand one meter high, which makes them one of the largest items discovered from this time period. 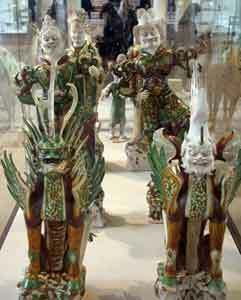 The figures come from a tomb of a very important official of the time a man named Liu Tingxun. The group of figures are made up with two beasts, two guardian figures and two official characters one of Military origin and the other civil. At the end of the hall hangs a very large 15th century wall painting which came from a Buddhist temple. Sitting in front of it are three figures who are guardians to heaven and hell known as Louhan's. 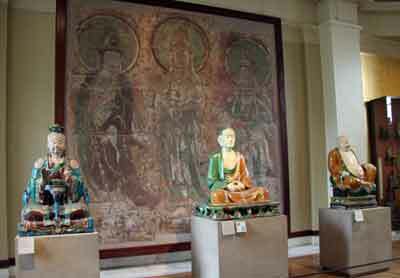 Louhans were disciples of Buddha and were made to represent his teachings. They were often highly characterised to show different aspects of the teachings of Buddha such as respect, humility, wisdom or good and evil. These sitting figures are made from stoneware and are glazed using colours favoured by the Tang dynasty.